Jesus spoke to the crowds about the kingdom of God, and he healed those who needed to be cured. As the day was drawing to a close, the Twelve approached him and said, “Dismiss the crowd so that they can go to the surrounding villages and farms and find lodging and provisions; for we are in a deserted place here.” He said to them, “Give them some food yourselves.” They replied, “Five loaves and two fish are all we have, unless we ourselves go and buy food for all these people.” Now the men there numbered about five thousand. Then he said to his disciples, “Have them sit down in groups of about fifty.” They did so and made them all sit down. Then taking the five loaves and the two fish, and looking up to heaven, he said the blessing over them, broke them, and gave them to the disciples to set before the crowd. They all ate and were satisfied. And when the leftover fragments were picked up, they filled twelve wicker baskets. Christ loves us with His whole being. He became man that He might personally uplift our hearts with His truth, extend His hand to heal our wounds, and feed us with His own Body and Blood. Mothers have the privilege of experiencing this kind of self-gift. A mother literally shares her body with her child and shares in Christ’s pain at his or her birth. A mother continues to feed her infant with her own body and tend to the constant needs of her newborn. As her child grows a mother does everything she possibly can to care for the child’s physical, emotional, and intellectual development. Mothers take joy when their kids eat and grow, when they can comfort and guide them, and when they can make sure their child knows how loved he or she is. Today’s Gospel confirms that Jesus cares about our needs, even the basic ones like what’s for dinner. Moreover, He can provide in surprising ways since He can do the miraculous. The crowd of thousands ate their fill after having spent the day in a deserted place listening to Christ speak about the kingdom. So many times we try to cure ourselves or numb the pain in ways that only turn out to be self-destructive and leave us hungering. Instead, we should try reaching out to Christ in prayer and receiving the cure for all our pain in His Eucharistic Body and Blood. Jesus heals our hearts and frees us from the lies that we allow to burden us. He forgives our sins and gives us a new start with the grace and hope to be better. He fortifies us with His strength to persevere and He gently provides rest for our soul with His peace. He does all of this personally, directly, through His incarnate and immanent presence in the Eucharist. Christ gave His Body and Blood on the Cross to give birth to our new life. He instructed us to take and eat of this same Body and Blood which He made the sacrifice of the New Covenant. The Son of God became man that He might dwell among us and apply His grace to our soul. Today we honor the gift of His Body and Blood through which He feeds us superabundantly, strengthens us, comforts us, and nourishes our growth. Through the gift of His most holy Body and Blood, we receive life. Moreover, He continues to provide this gift that we might grow in health and maturity to the fullness of Christian life in the kingdom of God. Imagine you are one of the person’s in the crowd listening to Jesus speak about the kingdom of God and curing all those who needed it. What would you hear Jesus say? From what would He heal you? How might His Truth and His touch free you? 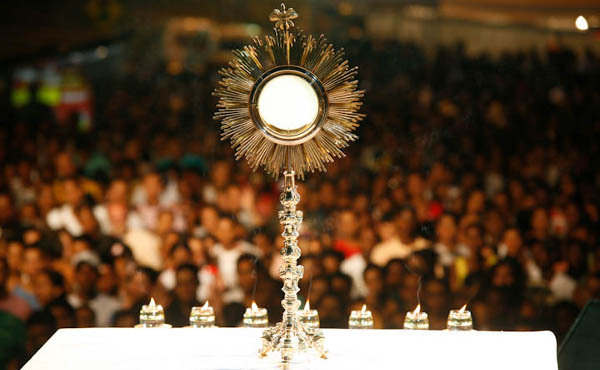 Consider how you have this very opportunity at the Mass – to hear Christ preach about the Kingdom through His priest and to touch you through His Eucharistic presence. Consider how a mother gives of her body for her child. A mother’s love tends to be a complete self – gift. Consider how the gift of her very body and blood, given in love, is a unique way to give of her whole self in imitation of Christ. Reflect on the gift of Christ’s most holy Body and Blood on the Cross and in the Eucharist each day this week. Attend a daily Mass this week in addition to the Sunday Mass. Give Christ your own Body through a physical sacrifice. Cheerfully offer Christ your labor of service for your family or work, look for a providential opportunity to serve Christ with your physical efforts, offer your sickness or suffering, or prayerfully consider something to fast from each day.